Kumlinge is a municipality consisting of a group of islands in Åland, an autonomous territory of Finland. On the 22nd (Sun), pause for some serene contemplation at Kumlinge Church. To see where to stay, ratings, reviews, and other tourist information, read Kumlinge trip itinerary planner. Edinburgh, UK to Kumlinge is an approximately 10-hour flight. Traveling from Edinburgh to Kumlinge, you'll lose 2 hours due to the time zone difference. Expect a daytime high around 18°C in September, and nighttime lows around 9°C. On the 22nd (Sun), you'll have the morning to explore before heading off to Mariehamn. Mariehamn is the capital of Åland, an autonomous territory under Finnish sovereignty. 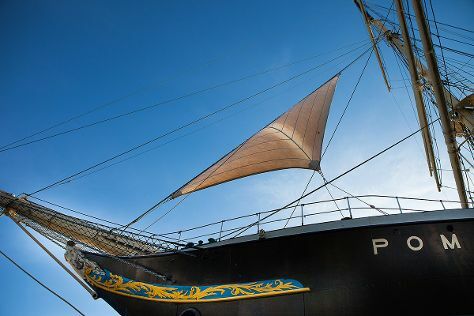 Museumship Pommern and Aland Maritime Museum will appeal to museum buffs. Get a sense of the local culture at Kobba Klintar and Kastelholm Castle. When in Mariehamn, make a side trip to see Bomarsund in Sund, approximately 32 minutes away. There's much more to do: have fun and explore at The Aland Island Art Museum, explore and take pictures at Wiklof Holding Arena, try your luck at PAF Casino, and take in the waterfront at The Maritime Quarter. Explore your travel options from Kumlinge to Mariehamn with the Route module. Expect a daytime high around 18°C in September, and nighttime lows around 9°C. You'll set off for Eckero on the 28th (Sat). Eckerö is a municipality of Åland, an autonomous territory under Finnish sovereignty. On the 28th (Sat), examine the collection at Aland Hunting & Fishing Museum and then examine the collection at Eckerö Post & tullhus. To see more things to do and more tourist information, you can read our Eckero online visit planner . Eckero is just a stone's throw from Mariehamn. September in Eckero sees daily highs of 18°C and lows of 9°C at night. Cap off your sightseeing on the 29th (Sun) early enough to travel back home.